AOTS is a men's service club that is affiliated with the United Church of Canada, but is open to all men on a broad ecumenical basis. AOTS aims to promote fellowship, deepen the spiritual life of men, and develop an effective program of Christian service. In fact, AOTS stands for "As One That Serves", which is taken from the statement by Christ: "I am among you as One that serves." (Luke 22.27). Although the goals of AOTS are taken seriously, club members enjoy the camaraderie of sharing, supporting, searching, studying, and serving together. AOTS fosters a good time for a good cause, mixing the social with the spiritual, as men of the church. AOTS was born in Vancouver in 1923. The first official club was formed that year by Dr Herbert Riggs, a physician at Kerrisdale Methodist (now Ryerson United Church). The concept spread quickly to other churches and communities on the West Coast, then steadily across the country. By the mid-fifties, there were close to 10,000 members in Canada and Bermuda. For more information of the history of the AOTS movement, contact the National Office. Here is a link to a more detailed history in the AOTS 75 Anniversary 1923-1998 History booklet. In the early years of its existence, AOTS, although recognized and encouraged by the church, was an independent organization. 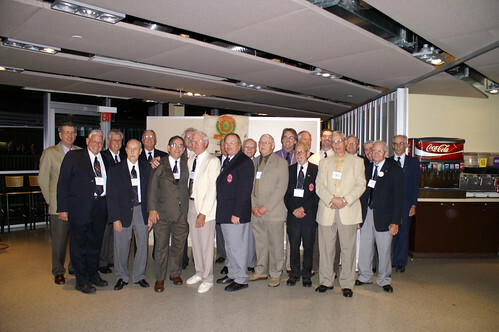 Currently, the National Association of AOTS Men's Clubs is officially integrated into the structures of the United Church of Canada. There are over 60 active clubs meeting and serving in communities across the country from Vancouver Island to Newfoundland and there are even more individual members as well. What Do AOTS Clubs Do? Supporting the local food bank or transitional housing organization. Providing leadership for youth activities in the church. Helping with the upkeep of local camps and sponsoring underprivileged campers. While they may serve an obvious practical purpose, AOTS projects promote fellowship and this "hands-on" approach inspires laymen to become more involved in the church. Is there anyone out there involved in Men's Ministry that has some examples of projects that they are working on? The National Association of UNITED CHURCH AOTS MEN'S CLUBS helps Christian men to pull together in bringing in the Kingdom of God, renewing and perfecting the high purpose of brotherly fellowship and through this fellowship achieving greater service. To be an arm of the Church reaching out in Christian Fellowship to all men. To deepen the spiritual life of men and to lead them to an understanding of the work and witness of the Church, that, through commitment to Christ, they may fulfill the Ministry to which they are called in the home, in daily work, in the community and in the world. To encourage and promote effective Christian Service. conditions as set out in the Bylaws. C. National Life Membership in The National AOTS may be conferred for meritorious service to The National AOTS on terms and conditions as set out in the Bylaws. D. Club Members, Individual Members and National Life Members shall all have the same rights and privileges. E. Membership fees shall be defined in the Bylaws. National Association of United Church AOTS Men © 2017 all rights reserved.